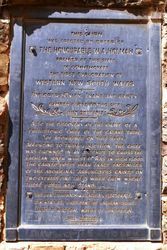 A cairn commemorates the first European exploration of western New South Wales by John Oxley, Evans and party. 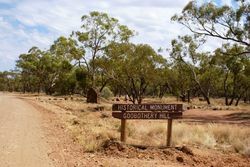 The Mayor of Forbes (Alderman J. J. Patterson) journeyed to Condobolin on Wednesday last to represent this district at the unveiling of the monument to mark the discovery by Explorer Oxley on the 29th July, 1814, of some interesting aboriginal relics about 20 miles below Condobolin. 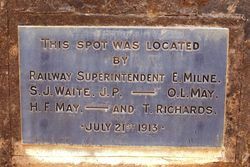 Railway Superintendent Milne, of Orange, was mainly instrumental in having this memorial erected. Forbes Times (NSW), 31 July 1914. Also the discovery of the grave of a prehistoic Chief of the Calara Tribe of Aborigines on this spot. According to tribal tradition, the Chief was drowned in an attempt to cross the Lachlan River whilst it was in high flood. The carved posts bear exact facsimiles of the Aboriginal arborclyphs carved on two Cypress pine trees which grew where the posts now stand. Thos. B. Watson. Mayor of Condoblin.